Thermal Imaging requires the use of special infrared-sensitive cameras to digitally record images of the variations in surface temperature of the human body. Thermography is basically like having your picture taken with a highly specialized HDTV night vision camera used to record thermal images of the heat patterns of the breast and other areas of the body. Thermal imaging was approved by the FDA in 1982, and is a completely safe, non-invasive medical imaging procedure that can detect signs of breast cancer up to ten years earlier than is possible using mammography. Without the use of radiation, Thermography is also used for early detection and monitoring a number of diseases and physical injuries by showing thermal abnormalities present in the body. Inflammation and other conditions can immediately be detected as well such as periodontal disease or infection that may go unnoticed by x-ray which is incredibly important to detect early when it comes to heart health and breast health. Although many people associate Thermography as a breast health screening tool, thermal images can be taken of the entire body or just regions of interest. X-Rays, C.T. Scans, Ultrasounds and M.R.I.’s are all tests of ’anatomy’ that measure the structures of your body and require the use of radiation. Thermography is unique in its capability to show the physiological change and metabolic processes occurring in the body long before other tests. Significant fibrocystic and other breast conditions can be detected with Thermal Imaging, benefiting especially women younger than 50 years of age. Other conditions such as auto-immune and estrogen dominance can be detected and monitored as well. 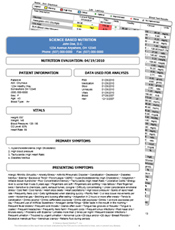 The Thermograms are stored on a computer and sent electronically to a medical doctor certified in thermal interpretations, for analysis and report. Your report is sent directly to you and to any other healthcare professionals upon your request.